Fitzgerald Moving & Storage has been the trusted name for commercial, industrial and specialty moving in the Annandale area since 1978. If you are planning a move to Annandale or relocating somewhere else, we are the moving experts that can be trusted to be by your side every step of the way. During the past 40 years in the Annandale area, we have handled every type of industrial and commercial moves. We realize that no two moves are alike and that is why we put our decades of experience behind every project. From our very first visit with you, we will figure out all needed details, including planning the journey, the transport and of course, the arrival at your new location. With 40 years of moving experience in the Annandale area, we guarantee that we will make your experience with us as stress free as possible. In addition to all of our other services, we can also offer professional packing. Need storage? Fitzgerald Moving & Storage has plenty of clean and secure storage space for both short and long term use. Annandale is a great place to live. Located in Northern Virginia, the population is just over 41,000 residents. The welcome sign coming into town reads “The Crossroads Of Northern Virginia”. The city has numerous parks in its geographical region that citizens of all ages enjoy year round. 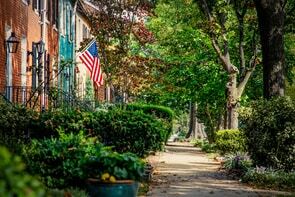 Annandale is only 12 miles from Washington, D.C. and many people who work in our nation’s capital commute back and forth daily. The neighborhoods of Annandale have many large, picturesque, vintage homes. Downtown Annandale is nick-named “Koreatown” as there are many South Korean owned businesses in the area. We have a dedicated team of office, industrial and commercial movers who will get you settled in your new location in the shortest time possible. As business people ourselves, we understand the costs associated with business operations being halted. Customer service is the foundation of our 40 successful years as an industrial and commercial mover. From the moment we take on your moving project, you will be assigned one of our outstanding customer service representatives who will act as your single source contact. Your dedicated person will coordinate your move from start to finish. If you are going to be moving to the Annandale area or anywhere else in Virginia, Maryland or Washington, D.C., please contact us today to see how we can make your move the best experience possible. Fill out our short, online form for a no obligation quote! © 2018, Fitzgerald Commercial Moving & Storage Co. Inc.